David Bedford contributed to the 5th and final This Is Not A Gateway Festival, November 2014. David Bedford contributed the essay; 'The Left; Enemies in the Struggle for First Nation's Justice?' to Critical Cities Vol 4. "David Bedford is professor of political science at the University of New Brunswick. He received his PhD in political philosophy from York University, Toronto, Canada. In addition to teaching and researching in political philosophy, he has taught and published on various issues on First Nations politics. His publications include articles on First Nations voter turnout, the relation of First Nations values and ecological politics, the political issues involved in self-government, and the Iroquois Great Law of Peace as a document of international relations. He has also published a book on the relation of First Nations and the Left The Tragedy of Progress: Marxism, Modernity and the Aboriginal Question." In this session David Bedford who is joining us from the east coast of Turtle Island (‘Canada’) will expand on the thesis of his book ‘The Tragedy of Progress; Marxism, Modernity and the Aboriginal Question’. David’s book pulls apart the assumption that ‘the left’ are or have been allies to indigenous peoples around the world. David shows how Marx and Engels’s ideas were rooted in myths of Western superiority and readings of their work, which argues that there are ‘stages of progress’, have done nothing to prevent the death of hundreds of millions of indigenous peoples, and propelled Westernisation and urbanisation right around the globe. This remarkable conversation will focus on Bedford and Churchill’s thesis that the Marxist notion of ‘progress’ as understood and utilised by ‘the left’/ ‘progressives’, continues to undermine the lives of the majority world, particularly the indigenous populations still under occupation. Were Marx and Engels’s ideas rooted in myths of white supremacy? Have readings of their work that argue there are ‘phases of progress’ enabled those with a vested interest to allow, participate or turn a blind eye to genocide, globalisation, land theft and the subsequent speed of urbanisation? What are the consequences or experiences of criticising ‘the Left’? Importantly, the panel will also discuss resistance and the struggle for self-determination. Photographs of David Bedford's London Visit. The archive includes photographic prints taken at David's two sessions at the 5th This Is Not A Gateway Festival. Most were taken by Rehan Jamil. We had the pleasure of hosting David in our home, so we have included a handful of personal photographs as well. The Tragedy of Progress was the closing session of the 5th and final festival. Audience listening to his talk. The archive includes a copy of The Tragedy of Progress, Marxism, Modernity and the Aboriginal Question (2001, Fernwood Publishing). At just 100 pages, this was a profoundly influential book for us and we include our personal reflection on the moment we found, located the book in the LSE library and how it helped rid us of the Marxism curse. This includes recordings from Saturday's The Left: Enemies in the First Nations’ Struggle for Justice? and Sunday's The Tragedy of Progress sessions. 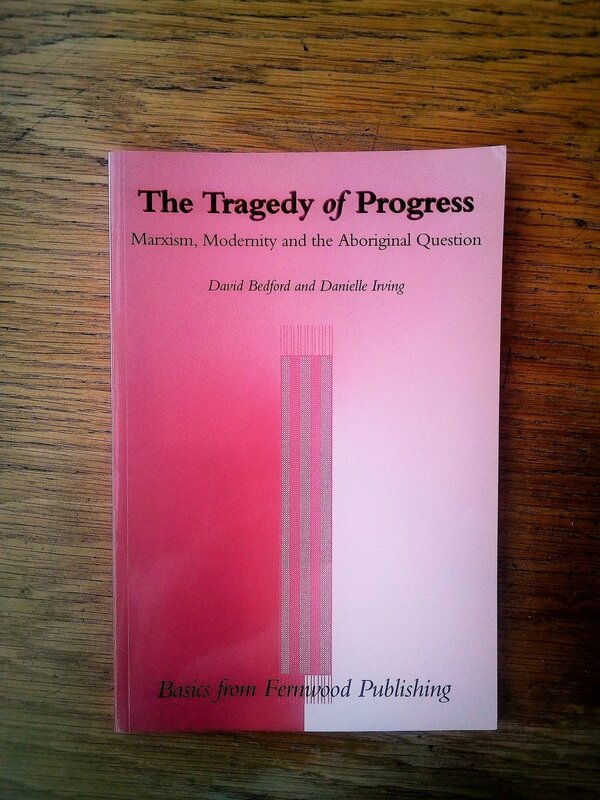 David Bedford's book The Tragedy of Progress, Marxism, Modernity and the Aboriginal Question (2001, Fernwood Publishing).